Today, the NSW Government has launched the Expression of Interest (EOI) for the sale of Sirius. For once we agree with the Government, the Sirius site is of State Significance, it is located in a critically important part of the Rocks and of Sydney, and it is an area of high amenity. But this is also where our agreement ends. Sirius is ideally designed and located for Key Workers to play their role in the working and functioning of our city. 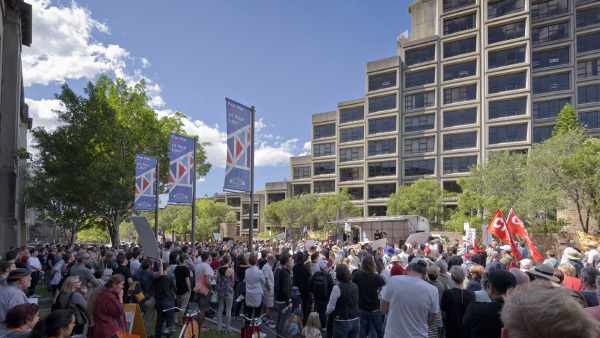 We again call on the NSW Government to stop the sale, deploy Sirius for Key Worker Accommodation, and list Sirius on the State Heritage Register. The real estate agents skirt the truth when they say Sirius is not State Heritage listed. It is. Sirius is still heritage listed on the states own s170 Heritage Register. Sirius has been recommended for State Listing by the Government’s own Heritage Council. “Sirius has a Green Ban placed on it. You buy this site at the risk CFMEU & Save Our Sirius will lock the site up if Sirius is not protected. We will picket line the site and disrupt any activity. “If you intend to buy the site and demolish the building, you will have trouble from the Green Ban and Save Our Sirius. “We strongly advise anyone interested in buying Sirius to work with us and the building’s original architect Tao Gofers, to preserve Sirius for state heritage listing. If you don’t, you run the real risk of trouble from the Green Ban, from Save Our Sirius, and from the people, cultural and heritage organisations that have been asking this government to find a better solution for Sirius. This entry was posted in Press Release and tagged affordable, brutalism, heritage, housing, key, our, save, sirius, social, sydney, worker. Bookmark the permalink.